Using a 1/4” Allen key, remove one of the screws which hold the headlight cover to the top yoke. These are quite tight, so take care. Fit the screen mounting bracket on top of the bush, add the washer and insert the replacement UNC screw. Do not tighten fully at this point. Repeat the operation for the other screen bracket. With both brackets ﬁxed, hold the screen blade in position and loosely ﬁt the four hexagon head machine screws with their washers, ensuring that they engage in the captive nuts on the brackets. Once everything is in position, gradually tighten these screws evenly until they are seated on the brackets. Do not overtighten these screws as damage to the brackets or threads may result. Looking at the front of the bike, make sure the screen is centrally positioned over the headlight. 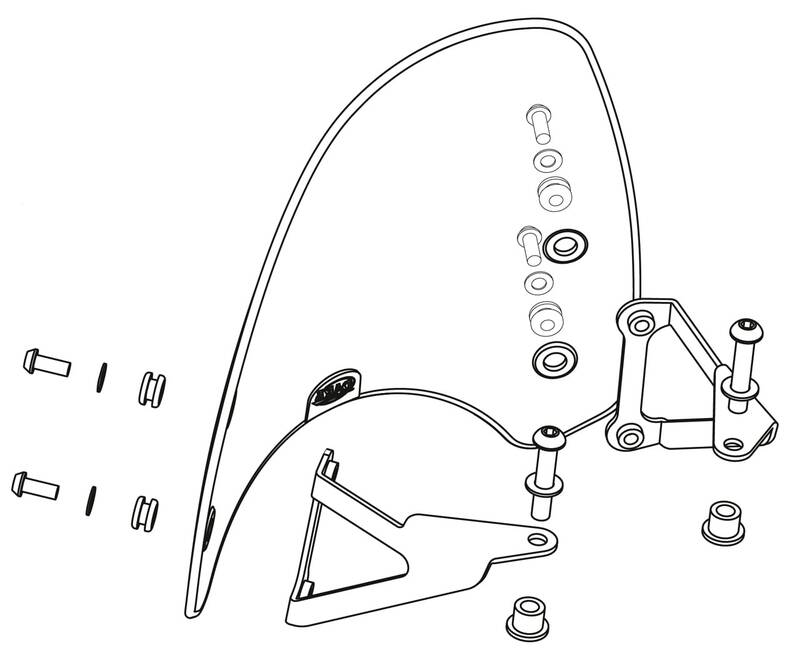 Once this is the case, tighten the two mounting bracket screws (the ones in the headlight cover) fully.